Like many other runners I have a somewhat unhealthy interest in shoes. My casual trainer ‘collection’ for years has been spilling out of the wardrobe. Whilst I don’t own lots of running shoes I am obsessed with finding the perfect shoe as well as having options for various conditions, distances and terrain for both racing and training. I’m a pretty neutral runner and spend almost all of my road miles in racing flats. Offroad I’ve generally been using Brooks Cascadia, Inov-8 F-lite 230’s and x-talons. I like them all for very different reasons without any of them being ‘perfect’. I used the F-lites in the WHW race this year. I love the no-nonsense, lightweight feel of them – they make you want to run faster. Only real issue is in the wet and with any signs of mud. They have virtually no grip at all. Manageable when you’re fairly light on your feet but still a challenge on steep muddy or grassy descents. After 95 miles + of the West Highland Way in pretty wet conditions I’m not sure they would be an automatic first pick the next time. I also suffered some swollen ankles etc after the race but that could be down to my own foot strength rather than a fault of the shoe. 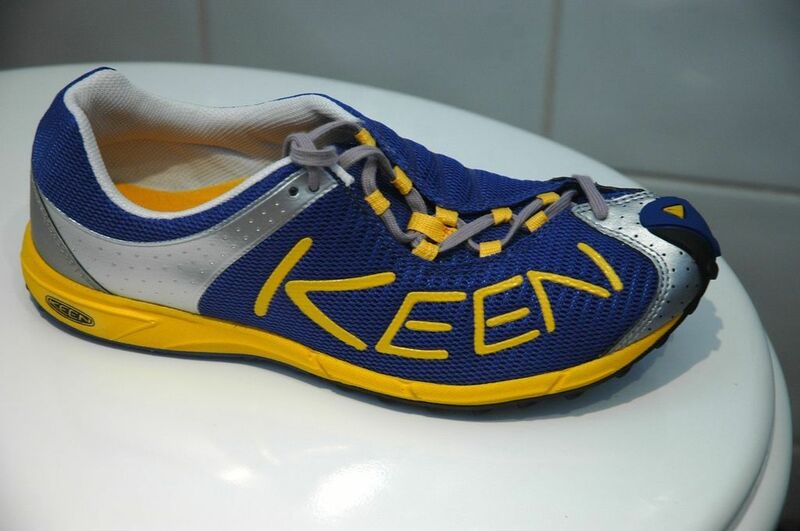 Anyway, I recently saw Keen’s entry into the ‘minimal’ trail running world with the A86. First impressions? What the hell is that? The slightly wacky styling has an immediate impact. As far as I can tell the American company doesn’t have much of a connection with off-road running here in the UK, so the brand has a long way to go to convince the Brits to even take note. The giant ‘KEEN’ splashed across the lightweight ‘mesh’ upper probably doesn’t help either but certainly makes it stand out next to the more refined styling of Inov-8’s and Salomon’s etc. The super-slick webtogs were offering these in the sale for £37 delivered (half the price of those I mentioned earlier) and I was in for a gamble at that price! They are pretty light at about 250g with an S-shaped lacing arrangement which having had some pains around the tops of my feet I was keen (couldn’t think of another word) to try out. The first thing I noticed as I picked them up to try them on was the size of the aperture (is that technical name for the opening?). It’s larger than any other shoe I’ve ever run in although it did feel a little strange at first having them laced to the top but with the tongue and laces not really reaching the top of the front of the ankle. Don’t get me wrong, they felt good, just a little strange. I have been guilty of lacing too high and too tightly in the past so maybe this offered some kind of solution. 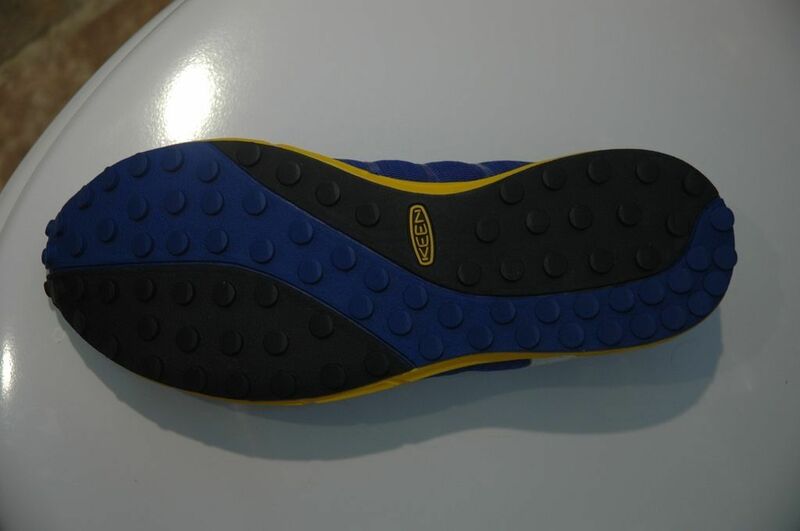 The sole is covered in small angled spot-lugs which looked to offer a decent level of grip without being bulky or cumbersome. 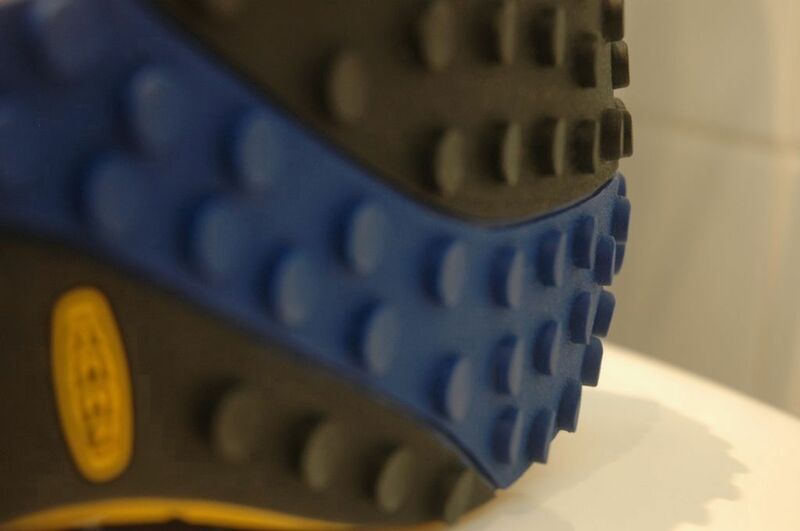 Couldn’t quite work out if the angle of the grips would particularly aid climbing or descending but on closer inspection the dimples on the forefoot are higher at the back and the opposite towards the back of the shoe – one for the ups, one for the downs. Clever stuff..maybe. I waited until the next day to try them out. I decent blast over the Braes would be a good initial test with a variety of hard-pack hilly trails, some mud and some grass. Feeling a little tight from the Friday run I wasn’t sure how kind they would be on my legs particularly over the first mile of tarmac. They felt good from the off though, soft around the Achilles with a bit of spring from the sole without feeling too disconnected from the road. On to the stony trail and again they kept their spring whilst providing plenty of terrain feedback. Certainly offered a little more protection from the sharper stones / rocks than the F-lites (they are new though I guess). In terms of feel / grip etc. (from the shoes that I have), the A86 falls somewhere in between an F-lite 230 and the x-talon 212 (albeit slightly heavier on paper). They performed well on all surfaces. 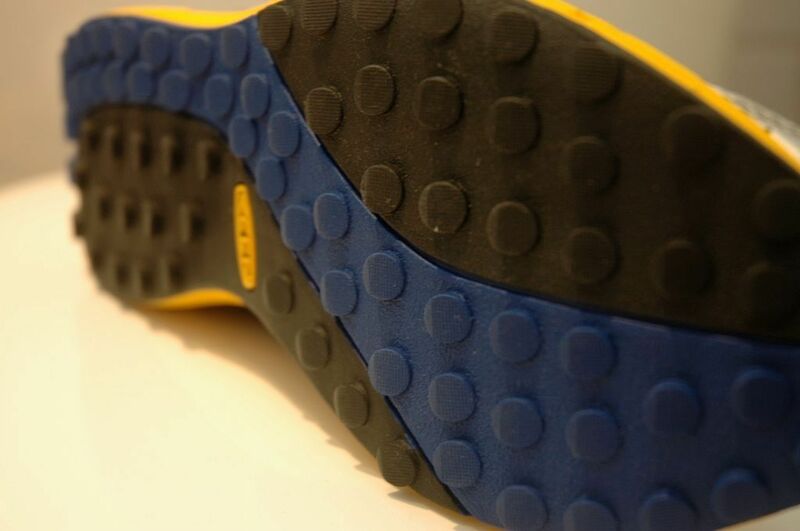 Plenty of grip for such a lightweight shoe, flexible on the rockier sections where quick changes of direction are needed and most importantly super-comfortable from start to finish. Bear in mind that these are a pretty minimal shoe so might be too light for some. Depends on what you’re used to I guess. …and before I knew it I was home after 13miles of very enjoyable running. Only slight criticism to date is on very steep descents it feels like my feet slip forward slighty more than is comfortable. Socks might not have helped though. I think I can say that I really, really like them. I’ll see how they fare on a longer and trickier run first before the final verdict. Not convinced that the grips will last too long on hard-pack and tarmac. We’ll see…. I’ll write up more when I get a chance – I’ve been on 2 x 30mile+ runs in them now. This entry was posted on August 20, 2011 by pyllon. 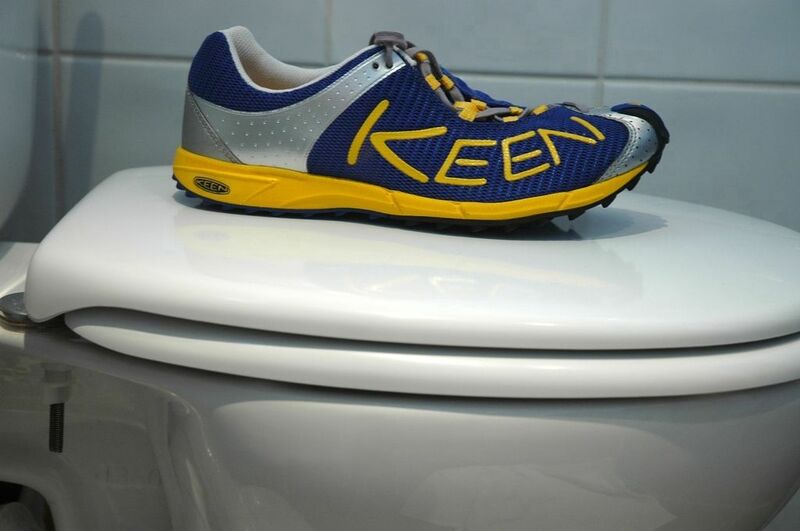 It was filed under A86, Gear, Keen, Minimal, Offroad, Review, Running, Running shoes, Trail and was tagged with A86, gear, hills, Keen, Minimal, offroad, review, running, running shoes, shoes, trail.